This exclusive, 14-suite townhouse is in the heart of the city, right next to the Spanish Steps. When in Rome, Portrait Roma is the place to delight in refined luxury, from exquisite furnishings throughout to the most attentive and discreet personal service. 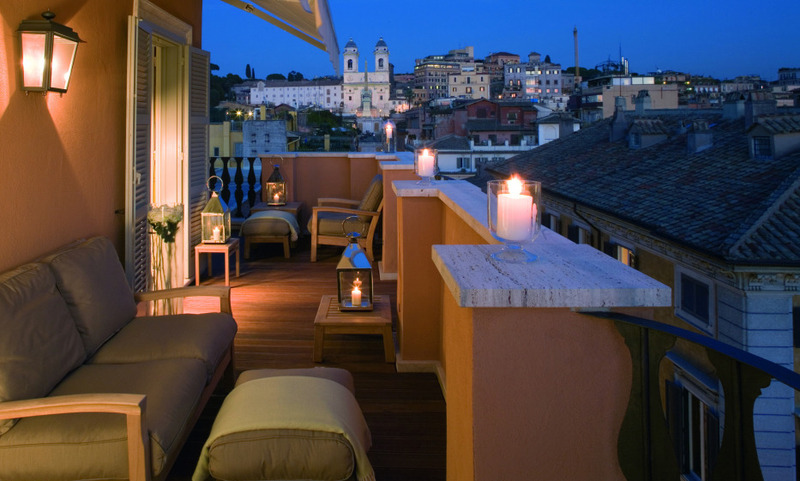 The magnificent rooftop terrace offers breathtaking views over the Eternal City. Location within walking distance to main monuments and main shopping areas. Very intimate and exclusive atmosphere in this 14-suite luxury hotel. We feel as if the Portrait Roma is now our new home in Rome. We will return again soon and look forward to visiting again with all of our new friend. Also, the golf cart tour of Rome with Igor was quite educational and the most fun we have experienced on a city tour. Wonderful hotel in a fantastic location (we stayed at Portrait Firenze last year). Staff are extremely charming and helpful. A wonderful hotel. It is a special place, with great hospitality and attention to detail. The staff had a wonderful generous spirit and sincere desire to serve. The upgrade was truly fantastic and generous. So many lovely details. Being very chemically sensitive, we didn't like scents being sprayed in the room, but we were able to open the windows (a real treat in a city hotel!) and air the room quickly, Really, we can only give Portrait Roma the highest praise. Charming, professional service. Perfect location. Excellent room. Exceptional roof terrace. We are well traveled and Portrait Roma is one of our top 5 favorites. Francesca was outstanding. Staff was terrific and responsive. Room and scents were tremendous. The Hotel Portrait Roma staff was exceptional. The manager, John, greeted us each time with a smile and was enthusiastic about us visiting his Hotel and Country. The rest of the staff shared that same enthusiasm. Our family felt like we were staying with friends rather then a hotel in a big city. Francesca gave us recommendations for restaurants and each one was better then the other. Vanessa and Alessandro helped us with every question and with great detail. Finally, Alessia served us breakfast on the roof and she was so warm and pleasant that she left us with a great feeling about Rome, Italy and humanity. Thank you to each person that we encountered at Hotel Portrait Roma!! Portrait Roma was beautiful and elegant. In addition, all the staff were exceptionally courteous and attentive to our needs. And they all dress in such a professional and stylish manner. Fabulous hotel in a perfect location. We had a wonderful stay!